Derby United referees and officials face a fast-paced paced and rewarding environment – working under several sets of rules, with skaters and officials from leagues both local and national. There are many positions that are filled for bouts and practices in order to provide a safe, fair, and fun environment for the skaters and fans. Derby United’s officiating squad, the Stripes, learns and enforces the rules of RDCL, WFTDA and JRDA. The Stripes are actively recruiting new members for their team. There are many positions on and off-skates for participants of all ages and abilities. Officiating is *your* chance to get in the game! Stripes to commit to 8 hours a month, about one practice per week. Bouts are generally on Saturday nights, and attendance at the preceding Monday scrimmage is mandatory. Many of Stripes spend a lot more time on Roller Derby, but that’s the minimum commitment. None! For skating referees – stripes (official referee jersey), skates, and personal protection equipment are required as well as personal medical insurance. For non-skating officials, a black top and a whistle is just about all that you’ll need. Contact the Stripes Captain to learn more! 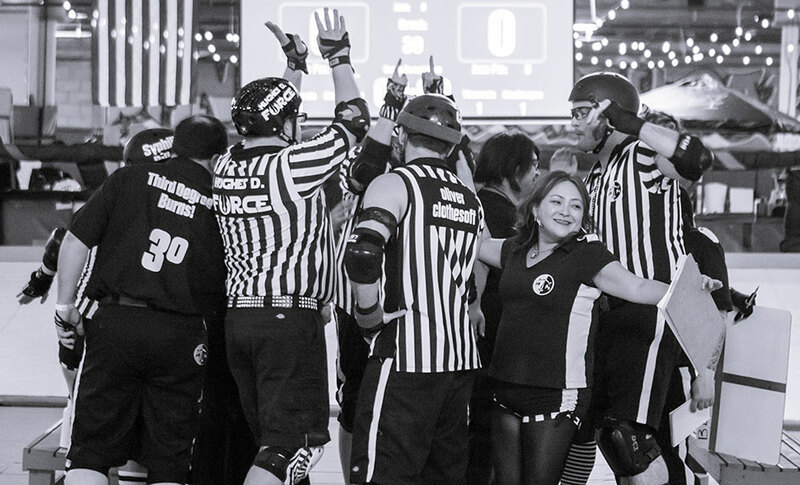 refs@sandiegoderbydolls.com.